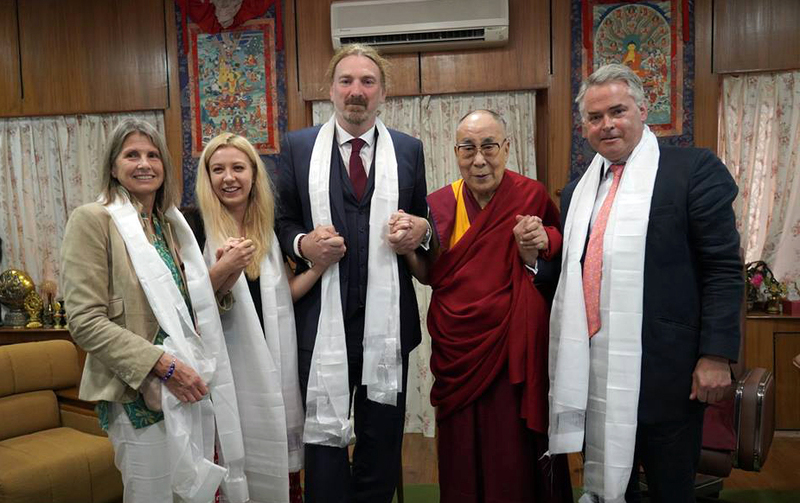 (TibetanReview.net, Sep30, 2018) – A group of three MPs belonging to three major political parties in the UK arrived at Dharamshala on Sep 26 and called on the Dalai Lama on Sep 28, said the Central Tibetan Administration (CTA) on its Tibet.net website Sep 29. The visitors have been named as Rt Hon Timothy Loughton from the Conservative Party, Hon Chris Law from the Scottish National Party and Hon Kerry McCarthy from the Labour Party. They were stated to have had a long session with the Dalai Lama on a wide range of topics which were mainly concerned with the Tibet issue. The group was also stated to have had a session with CTA Officials, staff and Tibetan NGOs later in the day, welcomed by President Lobsang Sangay. Loughton was stated to have told the gathering that while the UK Parliament may be divided on many issues, the one and probably the only thing that united the members was their solidarity with the Tibetan people and their willingness to fight for the cause of Tibet. “China is indeed a powerful nation. Howsoever, you deal with them the way you deal with bullies by standing up to them,” he was quoted as saying. Law was stated to have drawn similarities between Tibet and Scotland historically and culturally and affirmed his continued support for Tibet’s struggle. He has assured a possible debate on the recently passed reciprocal access to Tibet legislation by the US House of Representatives on his return to parliament. Deputy Speaker of the Tibetan Parliament in Exile, Ven. Acharya Yeshi Phuntsok, has reminded the gathering about the historical ties between Tibet and Britain, particularly the Shimla Agreement in 1914. He hoped the coming, 7th World Parliamentarians’ Convention on Tibet, to be held in November, will see more of participants.